Runtime: 92 mins, English audio. Our hero Maciste eschews tunic for loin cloth as he's hanging out in the African jungle and living the Tarzan life. 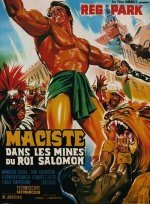 A traitorous minister in the city of Zimba which sits atop the legendary King Solomon's mines pulls a palace coup and the queen of a neighboring tribe of hunters takes over as queen. She enslaves the population to work in the gold mines. Funny as I remember King Solomon's mines they were diamond mines.